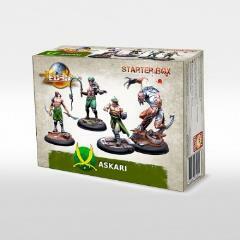 The january Fahim and the beast Alghûl are the driving forces of this new starter Askaris. But do not underestimate the Musharef and its slave. Customize your troops with a wide variety of mutations and test original tactics and missions against your opponents! 4 character cards, 3 missions, 4 tactics and 12 improvement cards. Rulebook 32 pages in French. Figurines sold unmounted and unpainted with plastic base.